Loggia conservatories were launched back in 2012 when they revolutionised the industry as part of the ‘Loggia’ extension range. Italian Grand Designs were the inspiration behind loggia extensions, with Loggia Columns delivering shape, style and thermal efficiency. Today, Loggia columns are used extensively in many different types of buildings - from contemporary aluminium glazed extensions and solid roof extensions, through to conservatories and orangeries. Over recent years, Loggia conservatories have become renowned for their exceptional thermal efficiency and have become a ‘go-to’ component for all sorts of home extension projects, not just those inspired Italian design. Most builders, architects and installers refer to Loggia Columns as super-insulated columns today, which reflects their role as a versatile, technologically advanced building product. Our Loggia Columns will add a vital touch of style to your new room. Whether you’ve been investigating conservatories, orangeries or house extensions, you’ll benefit from a stand-out design and improved thermal efficiency when you add Loggia Columns into your design plans. The timeless appearance of our Loggia conservatories – which are each combined with modern, cutting-edge technology – means that they blend in seamlessly with almost any age or style of property, while also delivering outstanding performance across a range of essential criteria. One of the appeals of our Loggia conservatories, orangeries and extensions is that they are easy to fit – much easier, in fact, than a brick pier of the same dimensions. Each column is pre-fabricated, so that minimal assembly and arrangement is required on site, while also precluding the need for messy and noising cutting on site. Loggia conservatories also provide superb levels of thermal efficiency. Compared to a brick pier of the same size, your newly fitted loggia will provide heat retention levels that are five times higher. Because of this, your new room will be comfortable year-round, and will produce a low U-value that reflects its ability to reduce your carbon footprint and lower your heating costs. Your Loggia extension can be bespoke designed to ensure it complements the design choices you’ve made elsewhere in your home and new room space. Your Ultra Installer will talk you through the benefits of choosing aluminium cladded panels, which come in a choice of five colours and can be completed using a fluted or flat design. If you want to personalise the appearance of your loggia further, select your preferred shade from our library of RAL colours. You can use this effect to support or contrast with your existing window frames – it’s your choice. Loggia Columns come in two sizes, and each of these has a different purpose. Situated at the corner of a structure, the large columns create a frame of sorts that lends a sense of presence and authority. Smaller inline columns are then interspersed throughout to break up the external appearance of the conservatory, extension or orangery. The roof system that you choose will be sited on top of your Loggia Columns. Each column will have been constructed using a dedicated insulated core designed to maximise thermal performance. An OSB board will be fixed onto the battens, after which a porous membrane and aluminium claddings are added. 10-year manufacturers guarantee, with the installer who completes the installation. You’ll have the option to use your Loggia Columns in conjunction with an internal perimeter ceiling, to which can be affixed different types of lighting and speakers. An advantage of this approach is that a real room feel will be created that’ll make your new space feel like an organic extension of your home. If you want to make the most of your Loggia conservatory, why not add bi-fold doors to the design of your new extension, orangery or conservatory. That way, you’ll be able to open your space to the outside – instantly creating a fantastic access point that will fill your new room with lots of light and ventilation. Visit our new page to read more about our super-insulated columns. 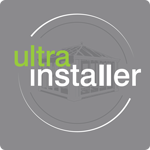 The outstanding aesthetics and market-leading performance haven’t changed, so contact your nearest Ultra Installer for technical guidance and help finalising the design of your brand new room.